First published in 1986. 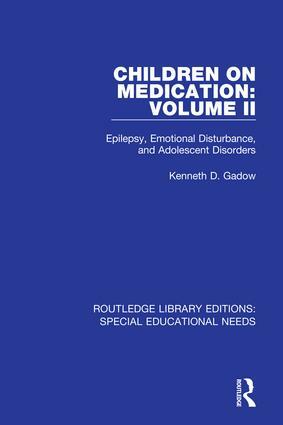 The primary purpose of this book is to provide information about the use of medication for several childhood disorders that require long-term treatment. It is the author’s expectation that this information will allow caregivers to make better decisions about the use of medication. This title also examines the importance of evaluating various aspects when medicating a child, including their characteristics, their family situation, and school setting. This set of 62 volumes, originally published between 1951 and 1999, amalgamates a wide breadth of literature on Special Educational Needs, with a particular focus on inclusivity, class management and curriculum theory. This collection of books from some of the leading scholars in the field provides a comprehensive overview of the subject how it has evolved over time, and will be of particular interest to students of Education and those undertaking teaching qualifications.